No Quarter at the Guggenheim Lab, Pt. 1: No Dogs Allowed? 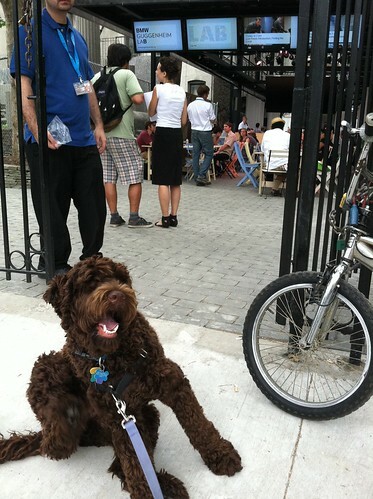 Yesterday, two downtown residents were surprised when they were turned away at the BMW Guggenheim Lab, the self-described “part urban think tank, part community center and public gathering space.” Here’s the first story, involving a dog named Finn McCool. The explanation was that there is a cafe on the premises, hence no dogs. “What about the recently closed and sadly missed Little Veselka down the block in First Park?”, I asked. “Dogs were welcomed there. They even sold a dog biscuit for fifty cents and left out bowls of water for thirsty pets. And, that was also on parks department, New York City property. The Lab was far from crowded and there was plenty of room for me and Finn McCool (that’s his name). The guy at the door said they would look into it. A spokesperson for the Lab told The Local that “dogs are allowed in the park area but not the structure.” Is that the policy which is actually being implemented? What do you think? Should dogs be allowed into the think tank? Next post Is a $3,500 One-Bedroom a Bargain?